Registering and maintenance of various “static” information groups, such as: vehicles, customers, hauliers, orders and products. Business requires knowledge (measurements) about various aspects of the business in order to be efficient and effective. Mass measuring can contribute to a range of production issues in most businesses. • Weighing vehicles during the entry and exit to a plant could be a way of monitoring pilfering, any unexplained discrepancies that may arise will result in further investigation. • Transport businesses need to ensure that the loading of their vehicles is within the limits prescribed by the road ordinance, or else be subject to considerable fines. 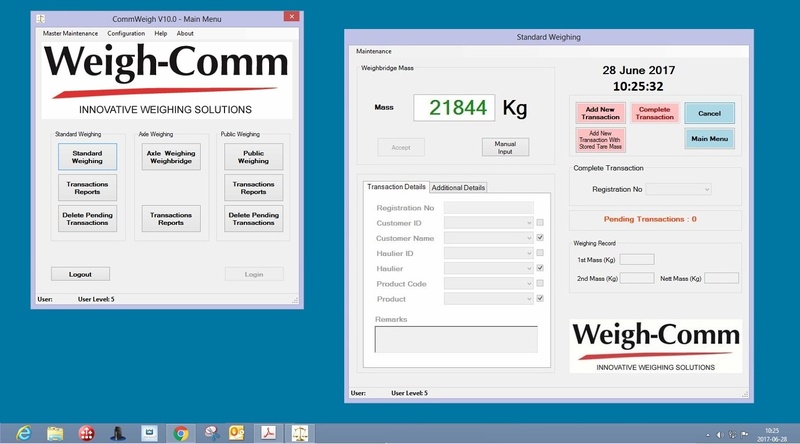 The main purpose of CommWeigh is to support the various weighing operations. However, each weighing needs to be put into context with regard to its relevant variable information, e.g. the identification of the customer, product, vehicle, etc. By maintaining thisinformation using a separate function, the operator performing the weighing is greatly assisted in that the entry of information is limited to the selection from a set of available options presented. An optional function within the standard CommWeigh includes the importation of the required “static” information from files prepared by another system. A weighing application typically involves two real-time weighings. The description that follows is for a business that receives raw material from a supplier. However, many other permutations are possible. The first weighing will be the arrival of a truck from the supplier with a load of raw material. The operator will typically identify and enter all the information relevant to the transaction: supplier, product, vehicle, order number, etc. The vehicle will be stationary on the weighbridge at the time of weighing. All the relevant information (including date and time) is then stored waiting for the second weighing. The second weighing occurs when the (now empty) truck departs from the plant. The operator will identify the truck and the weight will be recorded by the system as per the weighbridge. This measurement completes the transaction and the difference between the two measurements is recorded as the delivered mass. The system prints at this time a delivery ticket that includes most of the recorded information. The key information required by the rest of the business is the completed transactions. The standard CommWeigh provides an export mechanism where the completed transactions are formatted according to one of the available options and recorded in a file. The target system can then read the information from this output file for further processing. An import/export mechanism is also provided for the exchange primarily of “static” information. This may also include order information. A number of user defined fields are available. The user can utilise this facility to add own fields to the system that can be captured as required. Most of the business benefits to be gained have been alluded to above. The question may arise why this functionality could not be incorporated in of the existing computer systems. One of key the characteristics of a typical weighing application is that it has a real-time nature. This implies that it should be responsive, must be highly available and quite often requires 24(hours) x7(days) operation. With current technologies these requirements can be best achieved using a standalone system. Such a system should be able to continue operation in spite of failing communications lines or external systems.